I did much better at reading the chapters in time this week, and my suspicions were correct: I do definitely enjoy this book more when I'm reading it at a more leisurely pace. That being said, is it just me or was there a lot of fairly racist stuff in this week's chapters? I have no examples, because I'm not that organised, but there were a few bits where I noticed it. Sigh. Also, I had noticed this earlier but all of the female characters in this book seem to faint a lot! Was fainting actually that prevalent in that time (something to do with wearing corsets, perhaps?) or is it just Dickens being an arse? I also feel like I'm supposed to like Sam, or empathise with him much more than with the other characters, but he is kind of leaving me cold. I don't mind when he's interacting with the main characters, but as soon as he goes off to see his father or does anything on his own he starts grating on me. How does everyone else feel about him? Onto more positive points - I am definitely enjoying Winkle's ineptitude at everything. He is like me, although nobody would ever look at me and assume that I would be good at anything sporty, hehe. 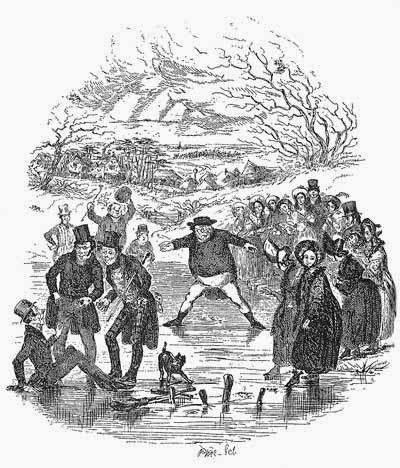 I really liked the ice skating chapter in general, although when Pickwick fell through the ice my first reaction was to think that he was going to almost die like in every other thing that I've ever read/seen where that happens. I also like that most of the scrapes that people get into are as a result of them being extremely British and not actually talking about stuff for fear of embarrassment/embarrassing the other person. When someone at some point started reciting (or whatever - yeah, I made no notes, sorry) A Christmas Carol, I really thought that we were going to get some prototype version of the later A Christmas Carol, which we didn't, but the goblin story was an awful lot like A Christmas Carol, right? I always think it's interesting to see stuff in earlier work that is then expanded on in later work. Makes me feel like some kind of literary detective! Although you know, the goblin story was quite boring. Why have goblins if you're not going to use them well? Silly Dickens. When I saw that the trial had a whole chapter of its own I groaned a bit, but I actually really enjoyed the trial. It was all completely ridiculous, of course, but that is definitely not a bad thing. Anyway, although I am enjoying some parts of the book, I am finding the whole thing is getting a bit stale. It is also far too long. If it was cut down so that only the actually interesting and amusing bits were in there, it would be much better! I am generally against abridging books, but I think I would enjoy an abridged version of this much more. This is also where actually have a plot would save the book somewhat, as at least I would (probably) want to know what happens next. As it is, I end up hoping that the next anecdote will be interesting each time I pick up the book, and I'm disappointed more often than not. ‘What, Sammy!’ exclaimed the father. ‘What, old Nobs!’ ejaculated the son. And they shook hands heartily. - I think I need to start using "What, old Nobs!" as a greeting. "‘Fine time for them as is well wropped up, as the Polar Bear said to himself, ven he was practising his skating,’ replied Mr. Weller." - What is Sam going on about here? Or any of the time when he's talking? "The chief features in the still life of the street are green shutters, lodging-bills, brass door-plates, and bell-handles; the principal specimens of animated nature, the pot-boy, the muffin youth, and the baked-potato man." - I have no idea what a muffin youth is, but I want to be one. Or a baked-potato (wo)man. Mmm, baked potatoes. "Veil, young brockiley sprout, wot then?" - Young brockiley sprout, hehe. I completely understand that! I think that maybe this is a book that is better to read slowly rather than to read at a readalong pace! I have to admit that I didn't notice the racism this week, which is terrible. I saw the sexism, but it's so prevalent that it's hard not to. I agree that we're meant to like Sam. I think he's meant to be the normal, likeable, rational in comparison to everyone else. I don't MIND him, but I hate the silly little metaphors he uses when he speaks. I think maybe I just hate the way that he speaks, hehe. If he spoke normally then maybe I wouldn't have so much of a problem. And yes, every time he says one of those stupid metaphors I get annoyed at the book. Although there was one during last week's chapters that actually made sense! Commenting late to this, sorry! Nothing really happens in this "book", so I agree, it's much better to read at a leisurely pace rather than trying to cram some chapters in. Man I totally missed the racism thing (... probably not a good thing), but the constantly fainting ladies have me riled up about sexism. Not a fan of Sam and his father. Winkle + gun = terrible life decision. Maybe I should start calling my younger sister "brockiley sprout". I'll tell her it's an upgrade from "moyashi", hahahaha!